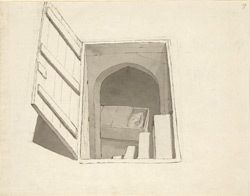 A drawing in ink of the vault and coffin of Humphrey, Duke of Gloucester, in St Alban's Abbey church in Hertfordshire. Humphrey became Protector of the Kingdom and Head of Government on the death of his brother Henry V, but was widely ridiculed for his apparent misadministration of public affairs and for failing to quell England's revolutionary turmoil in the early 14th-century. However, he was well respected in St Albans, and was admitted into the fraternity of the abbey in 1424, and buried here in 1447. He appears in Shakespeare's Henry VI, as "the good Duke Humphrey", set upon and destroyed by a conspiracy between the queen, the Duke of Suffolk and Cardinal Beaufort. Shakespeare's friend Francis Bacon lived around St Albans and perhaps influenced the playwrite's positive representation of Humphrey.